← The Shirts Have Arrived!! Following an excellent bacon sandwich and resplendent in our new shirts, thanks for organising those Les, 14 hardy Follies posed for a team photo and then set off on a very windy Old Nene course. For some, this was their first experience of a nine hole course, but, with a little orienteering skill, we found our way round ok.
We were accompanied throughout the round by the Boom Boom Boom of what could have been a ghostly Roman Galley drummer from years gone by. Whatever it was, it was loud, consistent and went on all day. Signage was lacking in a number of places and after the 5th, Omar’s group went left, then right and finally left again searching for the 6th. 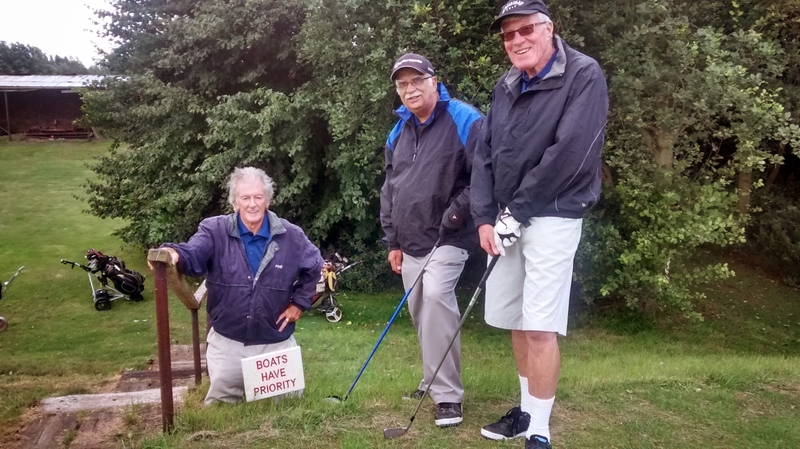 The 6th tee was different in that we’d never seen a ‘Boats have priority’ sign on a tee before. And sure enough a boat did pass between tee and fairway as Jon shaped to tee-up. From the elevated 6th tee, the flag looked a long way off – Colin S estimated it as about 3 miles and then went on to par it! A very disappointing incident was reported on the 11th when the group following Les’ group arrived at the green to find the flag horizontal/laying by the hole/not upright/not stuck in the hole. 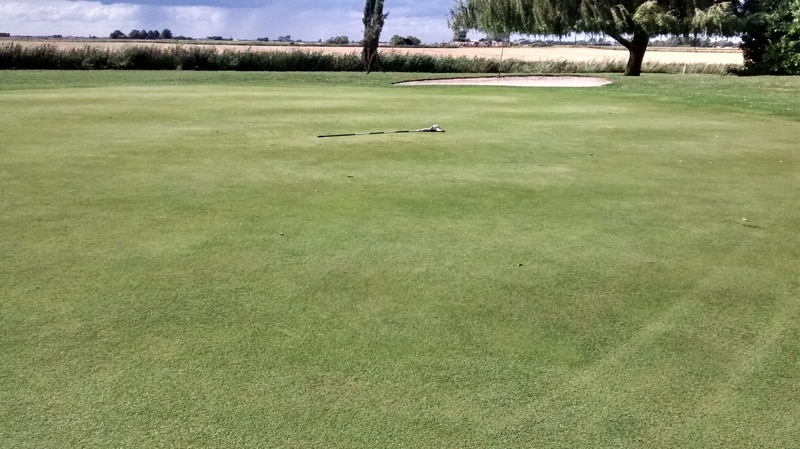 On the 14th, Martin drove off, his ball hit a tree and rebounded about 20 feet behind the tee. In the second group, halfway down a fairway, Geoff Delaney discovered his putter cover was missing. He ran to the tee, couldn’t find it, ran back to find it lying the other side of his bag. John Wakefield had a decent front nine but then the wheels came off. He lost 6 balls, played Robin’s ball instead of his own and when Robin said after John’s putt, “Take it away” John thought he had given him the putt but Robin meant the flag! 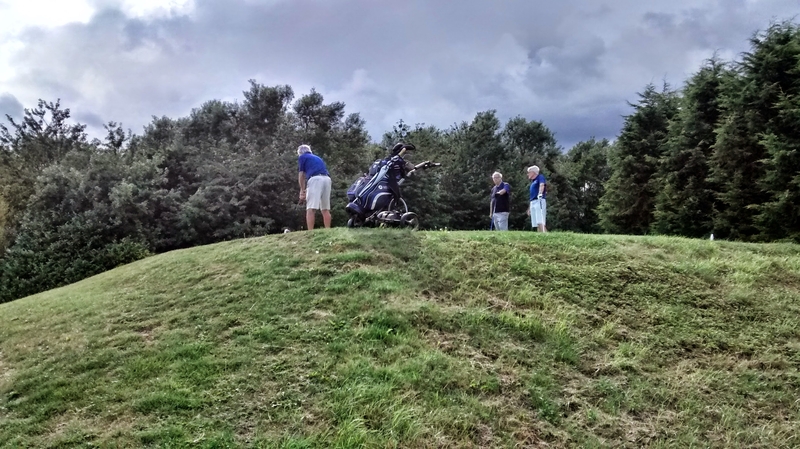 Towards the end of the round, the weather closed in and as the thunder started, the last two groups reformed as some pushed on and some sheltered. However, we all finished safely if damp. 1st Colin Savage with 39 points. Geoff then, on behalf of us all, wished Les well for his forthcoming ops and we all look forward to seeing him back on the fairways next summer complete with bionic knees. The next Follies outing is Friday September 19th at The Bedfordshire. Posted on August 18, 2014, in Uncategorized. Bookmark the permalink. Leave a comment.